It was Baltimore. Baltimore won the Super Bowl, Mr.
ON THE NIGHT of the Super Bowl, I started seeing the hashtag #Lastman pop up on Twitter. I quickly figured out that all of these folks using it were in a big game to go as long as possible without learning the result of the Super Bowl. The game is still ongoing, but the remaining players are dropping like flies. CNBC’s John Carney — who had told colleagues on Monday not to tell him the result, and who was only using Twitter by following certain key words — got knocked out today. Yesterday we caught up with Brendan Loy, a father of three who works at a law firm in Denver. He’s still in the hunt to be the #Lastman to learn #TheKnowledge. Loy is a Broncos fan, and only played because he didn’t have a dog in the San Francisco vs. Baltimore fight. So how does Loy avoid learning #TheKnowledge? He explained: “It changes day to day, and I’m only on my second day here but on Monday, you have to be very careful with newspapers, because every newspaper is going to have it on the front page. Electronically, Loy is only following a whitelist of safe people on Twitter, he’s not looking at any of his Twitter @-replies, and he’s not checking his personal email. When he recently had to search for something in GMail, he only looked at the computer from askance, while also squinting, so that he wouldn’t be able to make out any subject headlines. 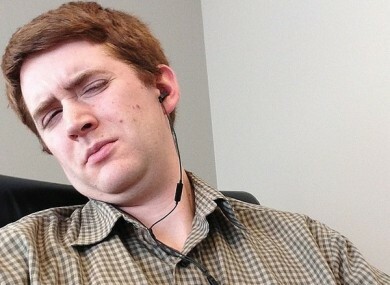 He took a picture to show what he looked like when searching GMail, above. So what did Loy do on the night of the Super Bowl? Basically watched Puppy Bowl re-reruns with his kids, aged 1, 3, 5. I’ve got three kids, ages 1, 3 and 5, so we were just playing and then we had dinner and we were going to watch the puppybowl, but actually we don’t have cable, we do pretty much everything through internet, or broadcast TV, so I couldn’t find a stream of the puppybowl, so we ended up watching some prior year’s puppybowl, which to me is all the same. We watched some of that and we put them all to bed and it was while i was putting them to bed that the blackout happened and i didn’t realize that until later on when I saw LastMan tweeting about it, and then once they were in bed, and the game was still going on, I was just doing some work and checking my safe-twitter account, and you know, I wasn’t watching anything. So what has Loy learned in this experience? A few things. One is that it really drives home what a unifying experience the Super Bowl is. He also realized how much concentration it takes to avoid media. He almost reflexively typed the letters “D… R….” into his browser to go to the Drudgereport, but thankfully he had installed a filter on it before the game. At another point in his office, even when he was thinking about not looking at the newspaper in his office’s breakroom, he forgot and briefly saw the front page, but averted his eyes before he was able to register it. How far does he want to go with it? Email “This man is trying to become the last man on earth to learn who won the Super Bowl”. Feedback on “This man is trying to become the last man on earth to learn who won the Super Bowl”.